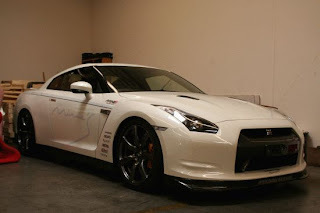 I had heard the Mines R35 was coming. Then I heard it wasn't coming. Then I heard it was ready to ship. Then I heard it was not coming for sure, then I see these pics. I guess one of the cars is here. Mines is looking to get a little more serious in the US market. Is Mines ready for the US Market? From my past experience with small Japanese companies, they can not usually translate/ figure out how the US aftermarket parts business works. They can not get with the whole network and distribution of parts that exists in the US. They either don't offer a good enough discount for shops to make money, or they artificially inflate their prices to make the discount structure look closer to what people are demanding for pricing. The weak US dollar makes most of the Mines parts a real hard sale in the US. Good luck to them. 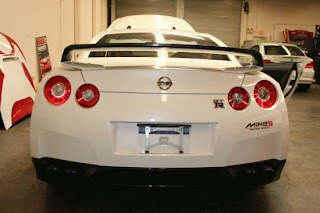 They will need it with companies like Cobb Tuning working on parts with their own R35 GT-R. Totally agree with you. Mines is obviously high quality, but their CF rear spoiler and front splitter are over $5k USD...each! I would expect their performance (brakes, suspension, exhaust, etc.) parts to be pricey, but some CF goodies need not be that costly, imo.